"There was a boy, a chess player, once, who revealed that his gift consisted partly in a clear inner vision of potential moves of each piece as objects with flashing or moving tails of coloured light: He saw a live possible pattern of potential moves and selected them according to which ones made the pattern strongest, the tensions greatest. His mistakes were made when he selected not the toughest, but the most beautiful lines of light." From The Virgin in the Garden, by A. S. Byatt Child, prodigies are found most often in three fields: chess, mathematics and music. All three depend upon an intuitive grasp of complex relationships. None depends on social skills, maturity, or insights into human relationships. A child who is a genius at chess can look at a board and see a universe that is invisible to the wisest adult. This is both a blessing and a curse. There is a beauty to the gift, but it does not necessarily lead to greater happiness in life as a whole. The wonderful new film "Searching for Bobby Fischer" contains in its title a reminder of that truth. Bobby Fischer was arguably the greatest chess player of all time. As a boy, he faced and defeated the greatest players of his time. In 1972, after a prelude of countless controversies, he won the world chess championship away from the Russians for the first time in years. Then he essentially disappeared into a netherworld of rented rooms, phantom sightings, paranoid outbursts and allegiance to a religious cult. He reappeared not long ago to win a lucrative chess match in Yugoslavia, for which he was willing to lose his citizenship. His games are models of elegance and artistry. His life does not inspire envy. 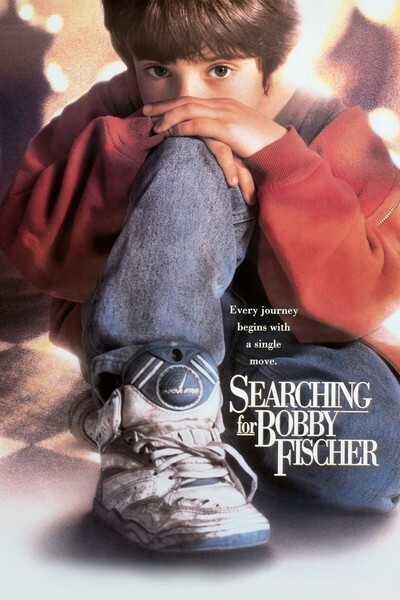 "Searching for Bobby Fischer," a film of remarkable sensitivity and insight, tells a story based on fact, about a "new" Bobby Fischer - a young boy named Josh Waitzkin (Max Pomeranc) who was born with a gift for chess, which he nurtured in the rough-and-tumble world of of chess hustlers in New York's Washington Square Park. His parents are at first doubtful of his talent, then proud of it, then concerned about how he can develop it without stunting the other areas of his life. The film is the first intelligent one I can remember seeing about chess. That is the case even though no knowledge of chess is necessary to understand it, and some of the filmmaking strategies - such as showing most of the moves at lightning speed - simply ignore the periods of inaction in games. It is intelligent because it is about the meaning of chess, a game that has been compared to war and plundered for its lurking Freudian undertones, and yet is essentially just an arrangement of logical outcomes. In the film, Josh learns the moves by watching them played in the park. At first his parents, Fred and Bonnie Waitzkin (Joe Mantegna and Joan Allen), are even unaware he can play, and there is a sweet scene in which the boy allows his father to win a game, to spare his feelings. Josh's first teacher is a black chess hustler named Vinnie (Laurence Fishburne), who uses an in-your- face approach and advises unorthodox moves to throw an opponent off. Eventually Fred becomes convinced his son needs more advanced tutelage, and hires the brilliant but prickly Bruce Pandolfini (Ben Kingsley), a difficult case - but then all good chess players are difficult cases. The difference in strategy between Vinnie and Bruce is much simplified in the film, and comes down to whether you should develop your queen at an early stage in the game. For the film, the queen is just a symbol of their opposed styles; the movie is really about personalities, and how they express themselves through chess. The screenplay by Steven Zaillian, based on Fred Waitzkin's autobiographical book, is best when it deals with the issues surrounding competitive chess. Is winning, for example, the only thing? Is chess so important that it should absorb all the attention of a young prodigy, or is his development as a normal little boy also crucial? Why does one play serious chess in the first place? There is a cautionary moment when Fred Waitzkin sees his first professional chess tournament - an ill-fitted room filled with players, mostly men, mostly silent, bending over their boards as if in prayer - and is warned that this is the world his son will inhabit. By the end of "Searching for Bobby Fischer" we have learned something about tournament chess, and a great deal about human nature. The film's implications are many. They center around our responsibility, if any, to our gifts. If we can operate at the genius level in a given field, does that mean we must - even if the cost is the sort of endless purgatory a Bobby Fischer has inhabited? It's an interesting question, and this movie doesn't avoid it. At the end, it all comes down to that choice faced by the young player that A. S. Byatt writes about: the choice between truth and beauty. What makes us men is that we can think logically. What makes us human is that we sometimes choose not to.